This is not a cookbook. There are no recipes, no suggestions for a pinch of salt. I cannot give you formulas with which to achieve instant success; nobody can. Fortunately, backgammon is much too complex for this. And that is the fascination: no two games, no two players, are alike. The move-to-move tactics are always different, always new; the battlefield is ever-changing. The game greatly depends on intuition, on feel, on experience — and, of course, on the dice. Therefore, the possibilities, the permutations and combinations, are infinite. And so, a book on the details of strategy would be almost as infinite. Actually, there is only one way to be a great: you have to play and play and play some more, and then begin to formulate your own set of tactics. What I can give you, however, is a basic approach to overall strategy: ideas that will make you think, help you to experience, and lead you to win. However, you must want to win. That may seem like an obvious statement, but is nonetheless important. My eleven-year-old daughter, who is a very good player, lost a gammon to me in a game that she thought she had a good chance to pull off. She was furious at both of us (herself for losing, me for winning); she turned on me with venom and blurted, “I hate you!” I knew then that she would be a great player some day: she had the right attitude. That’s my point. Good guys can win; they simply must have the right attitude. In addition to playing for the fun and excitement of the game, it’s all right to be cold-blooded in your approach to winning. You should never feel guilt because you’re hated; simply remember that you’re playing to win money, not a popularity contest. Such an attitude may initially serve to make your opponent more cautious, but it will also mean a more challenging — and more interesting — game. In the long run, however, it may also pressure him into making the fatal mistake. I shall therefore assume that you have both the philosophy of playing to win, and the conviction that you will win. Now let’s go on to the strategy necessary to implement this attitude. Strategy is the science or ort of planning the operations of war; since I consider backgammon a battlefield game, this definition of strategy is very appropriate. In this chapter I will discuss the basic strategy with which I play the game, setting it forth in broad concepts, so that you can see the overall pattern. Most present-day writers on backgammon recommend a running game as their basic strategy: get your men moving as fast as possible out of your opponent’s inner board; bring them around quickly; avoid a back game like the plague. 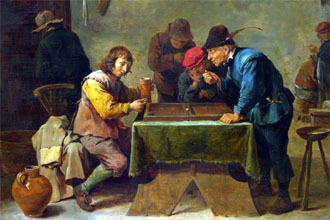 It is true that you only have to move ten men a total of seventy-seven points in order to be into your inner board and ready to bear off, but if this is what the game is about then all you’d really need do is have each player roll the dice ten times, say, and the one with the highest total would win. Obviously, there’s more to backgammon that this; the very derivation of its name (from the middle English baec for back, and gamen for game or sport) suggests the back game. I believe there is a simple reason why back games are considered weak: most players accept the philosophy that running is better. Then, when they are caught in a situation where their running game is not winning, or they have been hit several times and have been forced into what they think to be a back game, they are not prepared for it and are fated to lose. What is more, many players have not really learned how to play such a game. Most writers on the subject so strongly emphasize the running game, while making dire predictions of doom about a back game, that the basic fear of such a game and the resultant insecurity in the player becomes a spiraling liability. Consequently, the back game is virtually lost before it is even begun. It is a self-fulfilling prophecy. Now, let’s define a back game, so there is no question about what it is. Basically, a back game is an ambush — except that the player walking into it knows it’s there, and where and how strong it is. And the question of whether he’s caught by it or not is answered partially by the dice and partially by his knowledge of the probabilities of the dice. Essentially, a back game is the opposite of a running game. At some point, either because you have been hit frequently and have lost substantial ground, or because your dice have not been good, you find that your position is not as advanced in its forward game as your opponent’s. Unless you suddenly get lucky dice — which you can never count on — it is obvious that you cannot win in a straight race. Your only hope, then, is to build either a prime or a side prime (or as much of either as possible) while at the same time obtaining or maintaining a position from which you can subsequently hit one of your opponent’s blots. Usually (and ideally) such a position from which to hit is in your opponent’s inner board, and so it has come to be called a back game. For a respectable back game, at least two elements must be present: I must have two of the points in my opponent’s inner board covered (or very likely to be covered), and my game has to be sufficiently slowed down so that when I do hit him, he either will be able to get back in, will be bottled up in my inner board, or will really have to run a gauntlet of my spread-out men, with which I hopefully will continue to hit him. Now, the basis of the strategy I advocate is that you must plan on the possibility of such a back game from the beginning, and remain sufficiently flexible so that can elect this course at your option. You will then have a very good chance to win. Simply put, if you make an early commitment to a running game and then in mid-game are forced to switch to a back game, you are doomed to failure. Conversely, making too early a commitment to a back game is likewise a mistake. I do not advocate either game per se; I do recommend that you make no early moves that commit you one way or the other. This is the most important advice I can offer on strategy. The early tactics involved in the implementation of this strategy depend on position and control; the game I start with is a slow and uncommitted one. Essentially, my prime objective at the beginning of the game is to make strong blocking points, which will serve to bottle up my opponent in my inner board. I love to go for a side prime as soon as possible; I think this is the best way to win. There are two reasons why I think a side prime is preferable to a prime, at least in the early stages of the game. First, if you start making doors on your inner board, such as the 1, 2, or 3 points, these men are effectively out of action for the rest of the game. They cannot be moved to another position of possible strength, as can those men on a point in the outer board; making these forward positions in your inner board too early very often results in having to break up your board. By breaking up your board, I mean a situation in which you have a fairly effective blocking position, but lack sufficient flexibility to make your moves without breaking up these points and destroying the value of this lengthy block. The second reason is that I want my opponent to break up his board. By keeping several of his men bottled up in my inner board, yet allowing him to get back in quickly if I should hit him (either because I want to or have to), I am in effect forcing him to break up his blocking points. This situation can easily evolve if he starts running too fast, I make a few of the blocking points I like, and then manage to hit a blot or two of his. If he can get back in easily, yet finds himself bottled up, he will have to start moving his men to his 1, 2, or 3 points. In this event, I will have no trouble getting back in and around, should he hit a blot I leave. However, there is a danger you should be aware of when this happens: with such a “speed-board,” a lucky roll that gets his man (or men) out of my inner board and quickly around might allow him to win because of what has become an excellent board for him to bear off from. The most valuable points to cover at the beginning of the game are the 5, 7, 9, and 10, in that order; any two of these, together with the 6 and 8 points you start the game with, exert enormous pressure on your opponent, and certainly give you sufficient reason to consider throwing the doubling cube. And if I have managed to cover the three higher blocking points I like (that is, the 7, 9, and 10) I don’t even worry too much if he goes to my 5 point. I still have him fairly effectively locked in; but then, when I am ready for it, I also have plenty of room to start getting my men past him and into my inner board without too much danger. I know this is heresy, but try it and see. When I have a choice, I will generally opt for a builder in order to make another blocking point rather than run a man merely to make distance. I’m not afraid to take chances and leave men open if there is a possibility that they will be of value if they’re not hit; I don’t like to make moves to covered points just to keep my men safe and protected. There are those who caution to always cover your blot: leaving a man exposed, they warn, is to announce your masochism and invite certain death. There is some validity to this; having a man sent to the bar can easily set you back two or three throws, and you know how many games are lost by one. But faint heart ne’er won fair lady. There is an element of risk we assume throughout our lives; backgammon merely requires the same. Have the courage to take the risk. Especially early in the game the danger is not great; remember the odds of getting back in. Remember, too, the number of ways blots can be hit; when you have a choice, pick the safer position. leave it where it presents the greatest threat to your opponent. And, since you’re a gambler, gamble. But with probabilities. Not only is it exciting but, more importantly, it is a strong move to implement my strategy of initially going for the blocking points. (If my man on the W5 is not hit, there are thirty-one ways of covering him.) And whenever possible, I use my other openers in the same fashion. There is a second tactic to be aware of at the beginning of game; it is the converse of what I’ve been talking about. The blocking strategy I’ve proposed obviously works two ways; your opponent can — and may — play the same game. And, obviously, it would be to your advantage to dissuade him from doing so. The most effective way I know to do this is by splitting your back men. This at least doubles the number of ways you can hit any blot he brings into his outer or inner boards as a builder and actually puts enormous pressure on him. For example, another way of playing the 2-1 opener is by moving one man from the B12 to W11 point, so as to have a valuable builder in your outer board, and to move one man from the B1 to the B2 point. Look at the pressure you have put on him! You have more than doubled his risk if he moves a builder down to his outer for inner boards; you have also made it more difficult for him to move out of your inner board. Another reason to consider this splitting tactic as an opener is that for certain throws of the dice it is less risky and therefore may be preferable. However, the tactic of splitting weakens the option of readily going into a back game, for the B1 point is a very important one to have if you want to play a back game. How do you play against such a split on your inner board if your opponent makes it? If the split is to the 4 or 5 points, and I don’t have a better move, I generally will hit this blot if I can, even if I leave a blot on my own. Either one of these doors is a good point for me to have, and there is a fairly good chance I can cover either one, even if I have not brought another builder down from my B12 point. Should I be hit, it’s still early in the game and easy to get back in; I think it’s worth the risk. If the split is to the 2 or 3 points, I will not hit it. The reasons are simple. If I have only one point covered on my inner board (my 6 point), the odds of his coming in on his next throw are 35 to 1. Therefore, I really don’t slow him down too much; probably only five points at most, slightly more than half a throw. And the chances of his hitting the inner board blot I’ve left are 18 out of 36 for the 2 point, and 16 out of 36 for the 3 point. That’s almost 1 out of 2. Should I be hit, I will lose at least twenty points, the equivalent of three throws, which is not too appealing. And if I’m not hit, then I have the problem of covering this man, which means two men so far forward they are effectively out of action and have very little — if any — value this early in the game. There is one exception to this; if I throw a double five and my opponent has made the split to the 3 point. This changes things considerably, for now I can hit both of his blots and make two points in my inner board. Remember the odds? They are 3 to 1 against his bringing in both men on his first throw. Should he bring in one or both as blots, I can continue to hit them, and in this situation can probably quickly go into a running game. How do you choose which of the two approaches to use? Personally, I prefer the blocking tactic to splitting my back men — assuming I have the opening move. Of course, you can — and should — try them both, to see which you’re more comfortable with. If you don’t have the opening, but must make the response, my move is based upon certain considerations. Obviously, my first concern is what my opponent has done for his opener; his move may leave me very little choice. I also take into account the kind of player he is. If he generally sits back and primarily goes for his blocking points, I prefer to put the pressure on him that will counter this, knowing that I have somewhat more time to build my own blocking points. Here too, your response will depend to some degree on the style of playing you adopt.